America has always been a nation of tinkerers, inventors, and entrepreneurs. In recent years, a growing number of Americans have gained access to technologies such as 3D printers, laser cutters, easy-to-use design software, and desktop machine tools. This, in combination with freely available information about how to use, modify, and build upon these technologies and the availability of crowd funding platforms, is enabling more Americans to design and build almost anything. Empowering students and adults to create, innovate, tinker, and make their ideas and solutions into reality is at the heart of the Maker Movement. Since the first-ever White House Maker Faire, the White House has continued to support opportunities for students to learn about STEM through making, expand the resources available for maker entrepreneurs, and foster the development of advanced manufacturing in the U.S.
America has always been a nation of tinkerers, inventors, and entrepreneurs…think of Benjamin Franklin, Benjamin Banneker, George Washington Carver, Ida B. Wells, Henry Ford, Grace Hopper, and so many more. In recent years, more and more Americans have gained access to technologies that support making, such as 3D printers, laser cutters, easy-to-use design software, and desktop machine tools, along with freely available information about how to use, modify, and build upon these technologies. Such resources, in combination with growing networks of maker enthusiasts and crowd-funding platforms, are enabling more Americans to design and build almost anything. 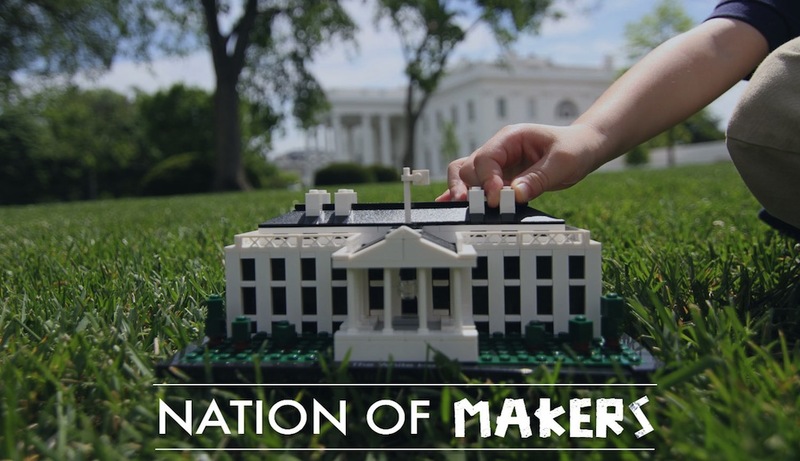 To celebrate this year’s National Week of Making (June 17-23), the White House will be announcing new actions by organizations as well as by recognizing individuals who are making significant contributions to Making and the Maker Movement. Help us celebrate that week by sharing stories of the countless leaders, innovators, entrepreneurs, and educators who work daily within their local communities across the country. Nominate an individual to be selected as a Champion of Change who is working to make advances in technology, platforms, educational opportunities, or spaces that empower even more Americans to become tinkerers, inventors, and entrepreneurs. In addition, having hosted the first-ever White House Maker Faire in 2014, the White House remains interested in learning about efforts by companies, foundations, schools, and non-profits to expand the resources available for young makers and maker entrepreneurs, and foster the development of advanced manufacturing in the United States. Submit your new activities, potential commitments, and other thoughts to help promote making in your community or all across the country. The White House will be celebrating the National Week of Making, June 17 -23. We invite libraries, museums, rec centers, schools, universities and community spaces to support and grow the number of our citizen-makers by hosting events, making commitments, and highlighting new innovations. The week will coincide with the National Maker Faire here in D.C. at the University of D.C. campus on June 18 and 19, which will feature makers from around the country in addition to federal agencies or departments. Last year, exhibitions or presentations at the Faire included: the National Science Foundation, U.S. Agency for International Development, Institute for Museum and Library Services, the U.S. Navy, the U.S. Army, National Institute of Standards and Technology, Department of Energy, National Aeronautics and Space Administration, Department of Homeland Security, the Smithsonian National Air and Space Museum, Veterans Affairs, U.S. Department of Agriculture, National Institutes of Health, the Federal Laboratory Consortium, National Endowment for the Arts, General Services Administration and U.S. Patent and Trademark Office. This year’s celebration continues the initiative originating in June 2014 when President Obama hosted the first-ever White House Maker Faire and issued a call to action that “every company, every college, every community, every citizen joins us as we lift up makers and builders and doers across the country.” Last year, President Obama built on the single event by proclaiming a National Week of Making and inviting people of all ages to hold events around the country celebrating ingenuity, inspiring creative problem-solving, and supporting opportunities for those from all backgrounds to tinker and make. Communities across America will be sharing and celebrating their involvement in the Maker Movement, using #NationOfMakers and #WeekofMaking on Twitter and Facebook to share their amazing work and connect with other Makers like you. Post photos of a current Maker project you are working on or choose a new project to work on, even asking a couple of friends or family members to build it with you, and tag it with #NationofMakers. You can find fun and creative projects ideas from a variety of websites for Makers. Organize an event and/or host an open house at your local school, library, rec center, makerspace or set up a hangout online to connect and share your inventions with Makers across the country. Be sure to share out the event on so others can find it. Volunteer to be a mentor for someone who is interested in learning a new skill or find a mentor who would be interested in teaching a new skill you’ve been wanting to learn for a while. Organize a maker roundtable, maker town hall, or maker tour to convene thought leaders and decision makers in your community. If you’re an organization or company, encourage your employees to volunteer as an educator and/or mentor to host maker-oriented workshops or classes in your community. Stay updated here, and follow along at #NationOfMakers and #WeekofMaking. The President discusses his visit to the South by Southwest festival in Austin, Texas, where he talks about civic engagement in the 21st century and how we can use technology to tackle our toughest challenges. Watch on YouTube | Read the transcript. Learn about President Obama’s bold new initiative to empower a generation of American students with the computer science skills they need to thrive in a digital economy. Individuals of all ages and backgrounds celebrated a National Week of Making: at the White House, in our Nation's capital, and beyond. President Obama hosted the first-ever Maker Faire on June 18, 2014. The Smithsonian takes a 3D portrait of President Obama. The President and the Vice President joined in on the "Hour of Code," learning to code with students from a New Jersey school. For the holidays this year, the White House featured Bo and Sunny in the holiday decorations as life-size, animated “dog-bots." The White House announces the winners of it's first-ever 3D-printed ornament challenge. The First Lady held a fashion workshop highlighting the growing role of makers and new technologies in the creative economy. Higher education institutions respond to the President’s call to support making on college campuses. Case Western is providing a makerspace and innovation center to give students, staff, faculty and members of the public the tools they need to create, build and invent. Young African Leaders joined the US Global Development Lab and the White House Office of Science and Technology Policy at Fab Lab DC to discuss the role of making in Africa’s economic and community development. On the day of the first-ever White House Maker Faire, cities around the country signed on to the Mayors Maker Challenge. These cities committed to taking steps to broaden opportunities for making in their communities. Since then, more than 100 cities have been taking action by doing things such as hosting mayor maker roundtables and town halls, supporting the creation of makers spaces and appointing a liaison or task force to establish collaborations that support local Makers. Using the map below, check out what cities have been doing and send an email to maker@ostp.gov if you have an update on what your city has been doing!